Vermont minimum wage workers have something to look forward to when the new year arrives – a $0.28/hour increase in their pay. For an average full-time, minimum wage worker that’s a $582 pay increase next year. Its good news for workers and for the state’s economy. How is the Vermont Minimum Wage Rate Adjusted? Vermonters are accustomed to seeing the state’s minimum wage rate increase every year. For most years over the last decade, Vermont’s minimum wage rate has been tied to the Consumer Price Index (CPI). Each year the CPI increased, Vermont’s minimum wage rate increased proportionately. For a brief period between 2015 and 2018, Vermont scheduled even higher increases to occur over the four-year period. 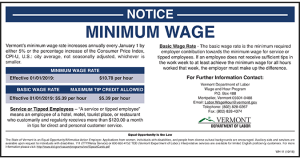 Beginning on January 1, 2019, Vermont returns to using the CPI inflation-adjustment formula to determine annual minimum wage rate increases. Accordingly, the Vermont Department of Labor (DOL) announced last month that the state’s minimum wage will increase to $10.78 per hour on January 1, 2019, reflecting a 2.7% increase in the CPI. At the same time, the tipped employee basic wage rate and maximum tip credit will increase to $5.39 per hour. What’s New About the Vermont Minimum Wage Notice? Historical minimum wage rates and tip credits have been removed from the posting. A technical correction has been made to the Vermont DOL’s website address. The Wage and Hour Program’s fax number and TDD have been updated. The new posting is dated 10/18. Employers can comply with the workplace notice requirement by updating their existing Vermont All-On-One™ Posters with a 2019 Vermont Minimum Wage Peel ‘N Post™ sticker or start the new year off with a brand new 2019 Vermont All-On-One Poster. The new year is just around the corner. Don’t wait, order today!